Nations Press feature health She Poured 2 Bottles of Coke all Over Her Hair-Result is Surprising!! 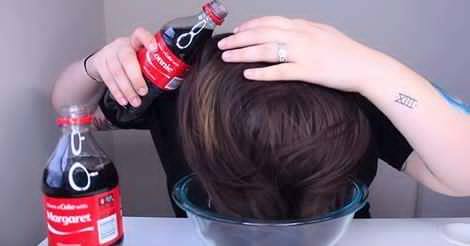 She Poured 2 Bottles of Coke all Over Her Hair-Result is Surprising!! SPONSORED LINKS Ellko, is a girl who tries bizarre and interesting beauty hacks to see if they really work and you can find her videos on Youtube. This time,” Ellko tries the infamous ”Coca-Cola Hair Rinse”.When you run out of your usual sea salt spray, you can grab a can or bottle of Coke and rinse your hair. This is supposed to turn fine, straight hair into shiny and textured curls.Elko proved that this theory is absolutely true. She used two bottles of Coca-Cola and her hair texture was completely changed.